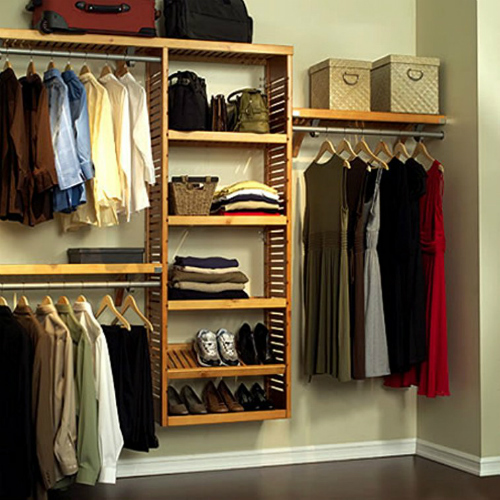 The closet space is a useful area in any average home taking into consideration the essential items it stores. However, it is surprisingly common that very few homeowners have a keen interest in the neatness or organization of this crucial space. In most cases, many fail to realize that having their closets well-cleaned and organized does not only make their rooms look more attractive, but also makes their life hassle-free given the ease with which one can pick anything from the orderly sets. Not to mention, if your closet is disorganized, you will end up spending a lot of time and effort trying to find that dress, sweater or shirt you want to put on in the morning as you set off for work. And that is where an appropriate closet organizer system carries the day. Having your closet clutter-free is a walk in the park if you can get the best organizer system. The beauty of these units lies in their ability to hold a wide variety of items with most offering ample shelving and hanging space which fulfills most storage needs. In essence, they provide the best way to put to optimal use every bit of space available. In the market today, your search for the most appropriate closet organizer system can be an uphill task given the countless alternatives available for purchase. From freestanding to wall-fixable versions to wooden and wire shelving construction, the options are so open. The more reason you should closely focus on your needs versus what a system has to offer rather than aesthetics. No matter your approach to getting whatever piece you want, always strive to end up with a model that guarantees timeless service while adding the much-desired simplicity to life. To help your search for the best the market has to offer, have a look at some of the basic considerations below. When the mission is all about organizing the mess your living space nothing comes handy like a closet organizer system. While there are plenty options out there to choose from no unit can help you get the most out of your space like the RubberMaid Configurations Deluxe Custom Closet Kit. This rewarding unit is designed to help you achieve better closet organization while also allowing optimal space utilization. May be you are already asking yourself why this model from RubberMaid is a top choice. Well, they are a lot of reason to this regard and just by looking at all the details you will arrive at this obvious conclusion. To begin with, the RubberMaid Custom Deluxe package comes with all the hardware required to set up a stylish storage structure while putting the existing closet space to the best possible use. With some basic household tools, this versatile system is quite simple to install considering it comes with easily configurable components. You can have it up in minutes creating shelf space, hanging space, and also fix in the telescoping rods for a whole new experience. Your clothes, shoes, and accessories can then forever remain in full view and accessible such that when you need something, you can just grab and go. Another beauty of this system lies in the unlimited ways you can customize it depending on your needs. The 4 to 8 ft. RubberMaid Configuration Deluxe kit can be adjusted to give up to 22 ft. of shelving space and 12 ft. of hanging space which can be adjusted depending on your preference. Whether it is a reach-in or walk-in closet you can have it ready without any cutting or permanent modification of the components. The immense flexibility in design is super awesome making this closet organizer system irresistible. As if that is not enough, you have the freedom to add extra wall rails and shelves if you so wish. There are also endless accessories such as baskets, hangers, bins, hooks that can be bought separately to complete your taste or to ensure even the tiniest bit of space does not go to waste. In conclusion, the RubberMaid Configuration Deluxe is that perfect fit for anyone looking for an affordable and customizable system that helps maximize storage space. With this, you get enough hang- section, top rails, and ample space for storing boxes for rarely used items. The same way you have sufficient shelves to keep all your folded clothes and shoes among other things. If you have been craving for an attractive mess-free closet, it's just this single package, and your dream can become a reality. Maybe you will need to add wall anchors for reinforcement after drilling the holes just to be sure it can handle the full weight or in case of overload. Considering the finishing is virtually maintenance free, you cannot get a better deal at its price. The ClosetMaid brand has been in the production of closet organizing systems for quite some time now. Every piece of their creation has always provided consumers with a complete package that at every turn delivers punches of victory in the face of all manner of closet chaos. 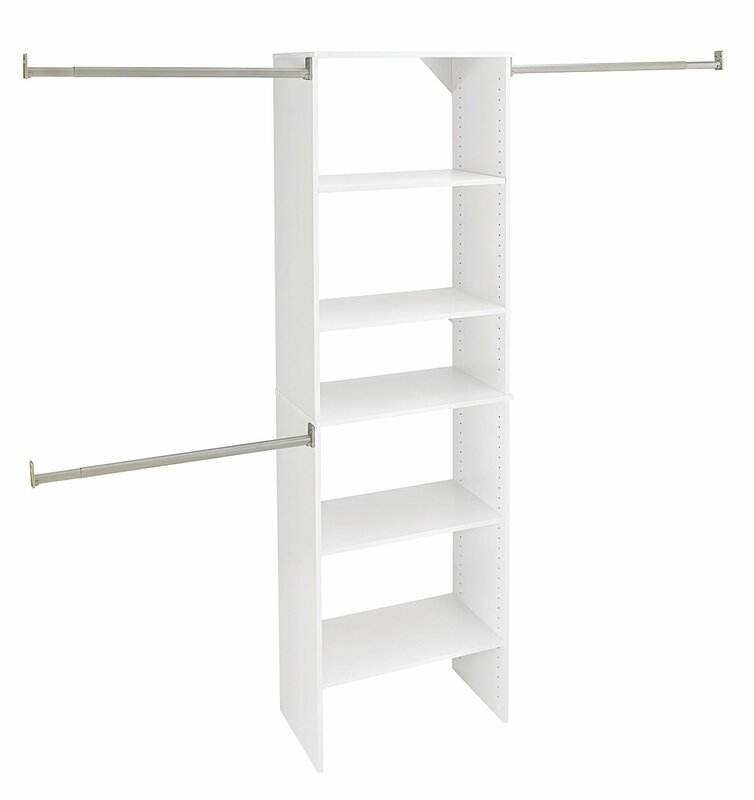 And its 22875 ShelfTrack adjustable closet organizer is nothing different. Designed to offer a blend of features and value, this system is a great choice if you need to get to elevated heights in matters closet orderliness. ClosetMaid 22875 ShelfTrack is by far a favorite due to the limitless possibilities it will allow you to enjoy while keeping your items and accessories orderly, safe, and accessible. With this unit, you can expect plenty storage room in the form of drool-worthy customizable spacing inherently tailored to meet crosscutting tastes. Going by its flexibility you get in fixing the unit into the designated spots, there is every reason to believe the 22875 ShelfTrack is the real deal you may have been looking for all this time. Talking of convenience, the manufacturer avails the 22875 ShelfTrack with all the necessary components you will need to put up the closet. From closet rods, wire shelving to brackets and support rods among other configuration hardware, all you need has been availed so your work will be near effortless. Once the closet space is ready to take up the structure, you will only need necessary home tools to embark on installation. No cuttings, modifications or expert skills will be required to have it ready for use. In essence, the system is easy to configure and you can also alter it to suit your specifications without much ado. When it gets to putting to use the space available, this unit will help you to get the most of what your closet spot has to offer. Providing between 144 and 216 inches of shelf space and 96 to 132 inches of hanging space adjustable according to your closet size in question, the ClosetMaid 22875 ShelfTrack will for sure turn your irritatingly cluttered space into a timeless marvel. You can keep all your stuff neat and tidy consequently benefitting from stress-free access to clothes or shoes as soon as you need it. You can expect an unlimited state of organization with its super adjustable shelves which you can keep altering as your storage needs changes. You are also at liberty to utilize a hanging basket that can take up extra items such as scarves, socks or hand purses among other things you may deem fit. To recap, the ClosetMaid is all about infinite storage possibilities. It will afford you more control if you want to add to the level of organization to your living space. At its price, it provides as an economical way to enjoy a well-arranged closet without digging deep into the pockets. If you buy this, you will have got that critical ticket to the much-desired organized oasis. Designed to fit multiple closets ranging from 4 ft. to 8 ft. When it comes to enjoying a clutter-free home, the right organizer system can make all the difference. In this regard, if you are obsessed with beautiful and organized closets, you have not seen anything yet until you check out the great John Luis Standard closet shelving system. John Luis takes all the organization needs a notch higher with beautiful solid wood closets that are one of a kind. Designed with various storage needs in mind, this standard wood shelving system offers a different level of performance-oriented features joined together to give an ultimate closet organizer unit. Whether you need a system to fill in your bedroom, laundry or pantry closet, this organizer kit is versatile enough to serve any relevant role. The John Luis Home Standard closet system offers 12 inches of shelf depth ideal for either small walk-in or reach-in closets. It is fit for wardrobes measuring up to 10 feet in length while allowing up to 24 feet of shelving space and 18 feet of hanging space. You will be happy to learn that regardless of what you keep on it the overall layout is well ventilated for maximum air circulation. Its open tower shelving will allow you to benefit from strategic storage spacing in line with various needs. Although the ability to customize the design is limited unlike in other wire shelves or modular versions, when you need a real closet organizer system to save you from the perennial organization chaos this unit will be good enough. It is no rocket science to put up no matter the level of your installation skills. You can follow through the wall mounting manual and fix everything seamlessly. All the same, you can still explore numerous configuration options available for added storage possibilities. On matters durability, the solid wood construction is impressive. The build is firm enough to last you for years without losing its classic appeal. 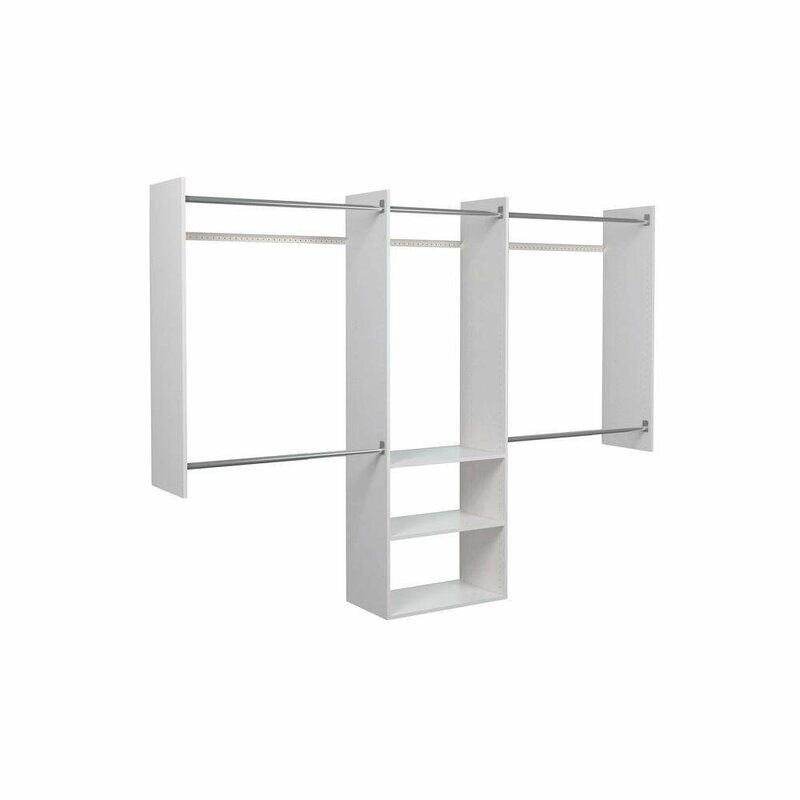 Ideally, John Luis grants affordable elegance through this closet shelving unit. For instance, all the metal hardware that comes with the system feature a stylish satin nickel finish. The adorable furnishing adds on to the decorative element many individuals who value aesthetics seek in any fixtures and fittings they acquire for their homes. Overall, the John Luis Home Standard Closet system is for those passionate homeowners who are looking for a combination of quality, price, and value. At its price, you will agree that it's a sure winner compared to most random wire units on offer. Thanks to its appearance and functionality you can improve your home and equally realize the ultimate closet perfection. While many remain guilty of disorganized living space in the absence of the right closet organizer system, you will be sitting pretty enjoying all the comfort brought about by this unit. Usually, no one wants to endure frequent hassles of putting in order a cluttered closet. As a result, having a suitable shelving unit is not only a practical way to avoid this common home problem, it is also very reasonable. So if you have been searching for a Closet Organizer that will sort your whole life out in light of the ever-increasing clothing and associated accessories collection, the ClosetMaid 24869 SuiteSymphony will work the magic. 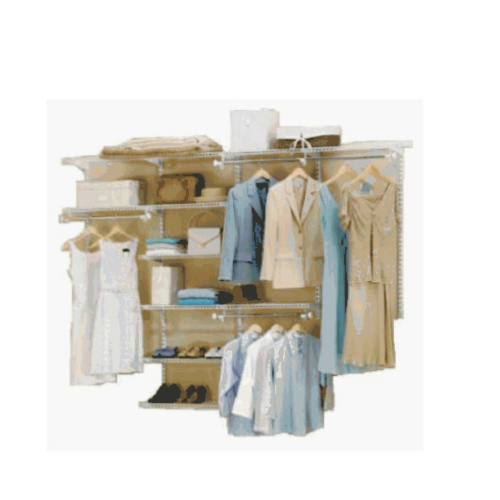 As a favorite unit from the ClosetMaid brand, the 24869 SuiteSymphony is designed to help you solve your closet organization dilemmas whether you got to deal with overflows or you just to keep everything neat and visible for easy picking when you need them. It is inherently a smart organization unit built to maximize the room at hand. With it, you can keep your possessions safe and neat as consequently minimizing any chances of loss or misplacement. Besides, it helps hasten the process of identifying and picking up an item when you want to dash out for work or some other errand. It is lovable that the system comes fully packaged with every component you need to have a functional closet. The unit comes with two sets of shelves for the top and bottom, four side panels, two adjustable shelves, six rod brackets, and three closet rods among other hardware components. Considering an elaborate guide is available, with all these, you have everything to sail through the installation efficiently without requiring additional parts. When it comes to exploiting the space available, this organizer system can create shelf space of between 55 and 120 inches and 144 inches of hanging space. Ideally, it is suitable for closets measuring between 6 to 9 feet in width. The unit is designed to allow adjustment of the shelves giving the user the freedom to customize the set up to their taste. Whether you want to add attachments like drawers or doors (which can be acquired separately) the choice is in your hands. With the ClosetMaid 24869 SuiteSymphony, you can begin a journey to an elevated state of closet organization. It will help free your home from clutter, for much-deserved closet appeal. Although you will have to pay a little more to get this model as compared to typical steel wire-based systems that should be expected considering this is of superior quality. In fact, taking into account the overall, durability, ease of configuration among other fantastic features this closet organizer is clearly a valuable pick. Organizing your closet is most certainly an intimidating task if you lack a proper closet system. Like many other tasks, you may carry out on a regular basis to keep your house in order, having a well-arranged closet requires the right organizer kit in addition to the do it yourself attitude. And that is where the Martha Stewart Deluxe starter comes in handy. Of course, it's common knowledge that consumers are happy to buy products that make their life stress-free. To that end, this organizer system does more than making life easy. Built to conquer all the closet chaos, this kit from Martha Stewart will help you do away with the mess in your closet in the best way possible. Whether it's that overflowing heap of clothes or the jumbled mess of the numerous pairs of shoes and accessories, its ready to take up the challenge for a whole new world of elegance. With this closet kit, every piece of item has a place where you can quickly pick it and get going without having to struggle before finding all you want. Taking into account the featured combination of shelves and hanging bars spaces, you can reap from the luxury of utilizing a variety of storage options quite comfortably. The kit features a versatile design that fits perfectly any closet that has a width of between 4 to 8 feet. As an ideal match for different situations and wardrobe arrangement requirements, you can add drawers, shelves, and baskets basically allowing you to maximize on every available space. And for those who value that magical glamour that adds on to the beauty of their home, this also does the trick. It comes with a scratch-resistant melamine surface that adds marveling touch that is irresistible to the eye. The Classic white finish durable enough hence it will remain dazzling for a long time to come. Besides, it works with almost all color schemes to keep you on top of the game as far as fashion matters are concerned. This is a fantastic choice if you want to buy a closet unit that promises timeless elegance while making your organization experience better by the day. You can henceforth leave behind the days of confusion to an eternal experience of orderliness. Above all, the price is quite pocket-friendly and the more reason you should get it. Whether you own a reach-in or walk-in closet, isn't it cool if you can just grab anything you want and get going without stumbling over clothes? If you are faced with typical wardrobe organization chaos, I bet you will love the tidy and neat appearance made possible with the ClosetMaid 1628 Closet Organizer Kit. This system offers a practical and economical way to take control of your space by placing everything you own in the most appropriate place. As such you will be able to enjoy added convenience when it comes to accessing any item be it a cloth, pair shoes or any other accessory. The ClosetMaid 1628 kit comes packaged with all the components you will need to fix it to the ideal working shape. From wire shelving and closet rods to support rods and brackets not forgetting other installation hardware, the manufacturer provides it all. When you buy this kit, you get a complete organizer system that only requires configuration, and you will be ready to arrange your possessions on it. And talking about installation, the procedure is quite straightforward. You don't need prior experience to get it right. Ideally, by following through the provided installation manual availed with the unit, you will have an idea of what it takes to have the organizer system in its designated spot. Manufactured to fit multiple wardrobe sizes, this system is ideal for homes with closets in the range of 5 to 8 feet wide. When fully installed the ClosetMaid 1628 is all about maximizing the use of every available storage room. It can provide hanging space ranging from 9 to 15 feet and shelf space measuring between 13.5 feet and 19 feet. So if you had your sweaters, jeans, shirts piled up in one heap, with this you can sort everything and turn the annoying confusion into well-categorized sets. Besides, the shelving is built to allow maximum ventilation even though it leaves no space unutilized. There is free air flow hence the closet will remain fresh just like the items you put into it. And just like it is with other versions from the ClosetMaid brand you can increase your storage options by adding accessories such as the hanging baskets to take on more items such as handbags and the likes. Similarly, you have the freedom to bring on shelf liners that add a smooth cover on the wire shelving. The shelf liners are especially vital if you want to deter fairly small items from falling through the wires. If that is still not enough, your options are not exhausted because you can explore the stacking shelf to increase your storage threshold. The ClosetMaid 1628 is a good buy for those who want to avoid unnecessary stress brought about by clutter overloads. It is one of the cheapest models you can find given the quality it grants the user in achieving an advanced state of organization. If you can imagine an orderly closet, then you won't regret getting this organizer system. If you got countless items and you do not have the slightest idea how to keep them orderly, do not get worked up because Sevilla Classics got you covered. The hundreds wide variety of clothing and shoes you have frantically tried to organize for quick reach when you need them can now meet their match taking up strategic spaces offered by this unit. This Expandable Closet Organizer System is designed to help you get to new organization heights because it is nothing but superior quality. Just as the name suggests, this kit is extendable. It can be used unexpanded or expanded. When expanded, on the lower side, it has a width of 58-inch. If used at this size, the center rods measure 36 inches and can handle up to 125 pounds of weight. On the other hand, when expanded the maximum width would be 83 inches with the center rods taking loads to the extreme of 50 lbs. 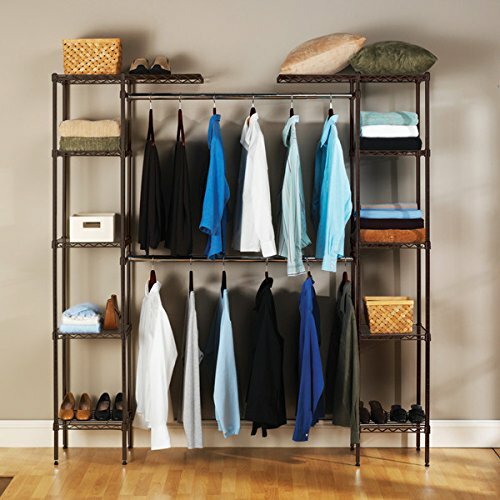 Its two clothing racks can be adjusted to fit any closet or improvised storages space. Both the shelving and hanging rods can get extended at 1-inch intervals giving you the freed to match available room. In essence, the Sevilla Classics Expandable can be used to create more room or supplement the storage unit you already have. So long as you have an empty spot in your house, you can play around with dimensions until you get the perfect fit. To enable you fully exploit your storage needs, this closet system features eight 14 by 14 inches ventilated steel wire square shelves. You can also take advantage of two other cantilever shelves measuring 14 inches by 28 inches which can hold more items than most conventional shelving. If you are worried that the wire shelf will not hold slender accessories, you will be glad that the manufacturer avails eight polypropylene shelf liners utilizable to give an even flat surface consequently enabling storage of thin accessories. On matters durability, you have the producer's assurance for extended periods of service without any signs of wearing out. The heavy-duty construction is entirely crafted out of industrial-grade steel wire meaning it can hold up as much weight as 100 pounds per shelf. Moreover, the zinc plating shields the wires from corrosion under unfriendly environmental conditions. Interestingly, it also comes with leveling feet to help keep the unit balanced and stable when it's fully configured. The Seville Classics system can enhance your creativity and style by organizing your entire wardrobe for the ultimate appeal. It is an ideal present you can give to yourself or someone else desiring to tame a messed up closet. And considering it's quite affordable, it's worth trying. 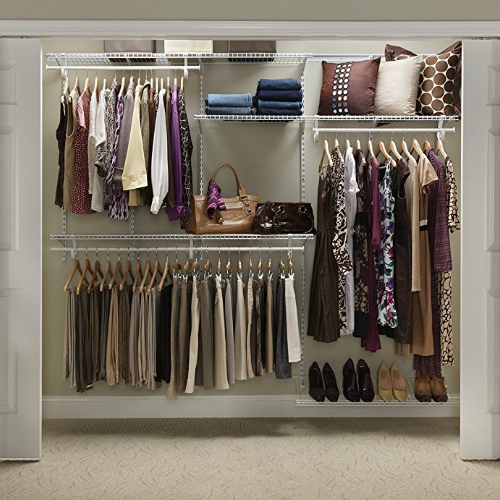 When it gets to streamlining your closet, the Whitmor Double Rod Freestanding offers a one-cut solution to all organization problems. Built to optimize luxury by putting to order all the clutter, this system is never about a quick fix but more of a long-term organizer that will make your living space forever adorable. In fact, whether you have a designated closet space or not, you have no reason to think twice because once you can get an ideal spot for it within your house, that's just good enough. The kit is all about making life easy. In the first place, piecing the parts together is pretty straightforward even for a first timer who has never fixed such units before. Since it comes with all the components you need to have it in functional shape, you won't have to buy anything nor need any tool to get things running. When fully assembled it measures 68 inches tall, 45.25 inches wide and 19.25 inches deep. It creates room to house all the shoes, clothes, and memorabilia among other personal accessories immediately you complete the configuration. You will be more than pleased to enjoy the 'grab and go' experience now that the closet comes with an open design that allows you to see and quickly access all the items you keep in the shelves. On matters storage space options, this system offers just enough room to hold all your items. To begin with, it features two garment rods, one in the middle and another on the top to adequately take care of all your hanging needs. And if you have long clothing such as overcoats and dresses, you can remove the lower rod to keep your stuff hanging straight. Similarly, it comes equipped with five handy wire shelves to accommodate foldable pieces of clothing such as sweaters or any other non-bulky items, for example, a purse. Notably, this unit has a load capacity of up to 150 pounds. The hanging rods can each take up 30lbs of weight, the top and bottom shelves can handle 20lbs each, and the remaining smaller shelves can hold a maximum of 10lbs each. This closet organizer boasts of solid construction that will last you a lifetime. Its frame is made out of durable steel with silver epoxy finish while connectors are products of heavy-duty resin. It will hold your possessions as expected without crumbling. The unit is very stable hence you don't have to fix it permanently on the walls to prevent it from toppling over during use. In other words, it remains portable at all times allowing you to change its location at will without limitation. 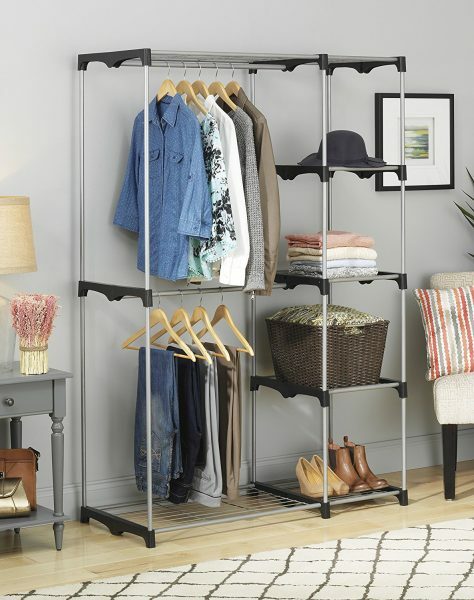 Whether you want it to occupy your current closet or use it in any other rooms, this freestanding closet organizer system is a real deal for common storage requirements. At its price, you can make your life stress free without breaking your budget. 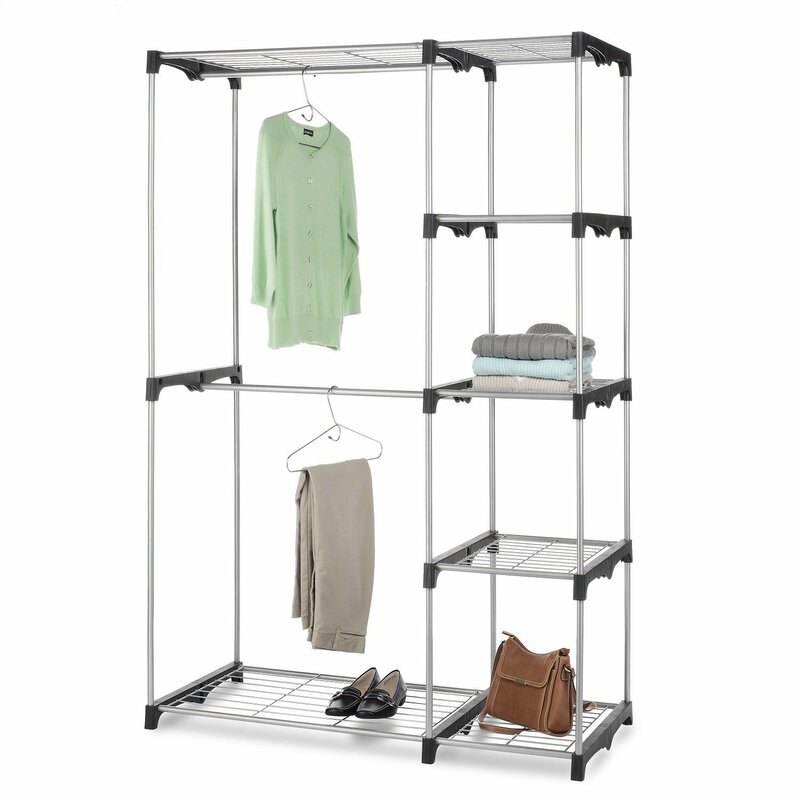 The Tespo Metal Wire is a top contender for those looking for the versatility afforded by wire shelved closet organizer systems. With this unit, you can forget about the jumbled mess that is subjecting you to a lot struggle whenever you want to access and use vital belongings in your living space. By all means, this is designed to enhance your ability to maintain a neat and orderly home in the most convenient way. Just like it is the case with most wire-based systems, you will not need any professional skills to have it in working order nor will you require any tools to cut or fix any parts. The components are quite simple to assemble such that by going through the manual carefully you will have a complete storage unit within a very short while. By the end of it all you a have a perfect structure that you will love to use in storing your essential items. 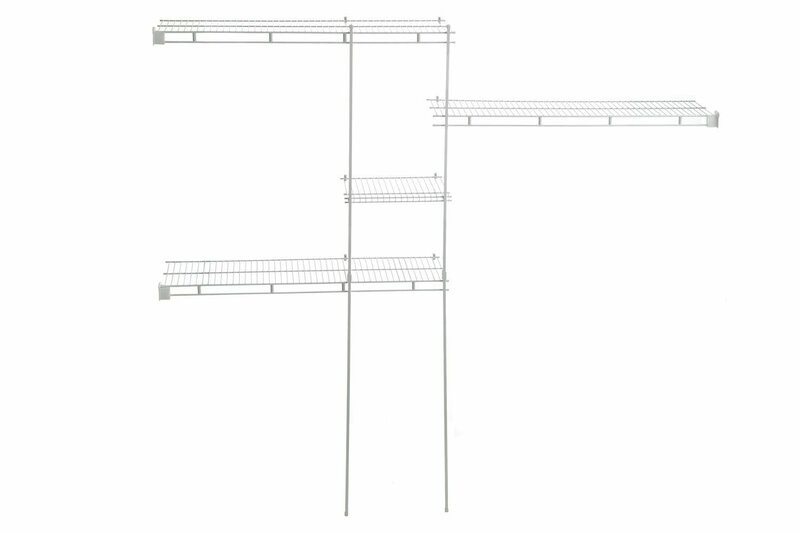 On full configuration, the Tespo Metal Wire closet organizer system measures 14- inches deep, 44- inches wide, and 55-inches high. The overall layout is a three by four arrangement providing a total of twelve cubes of dimensions of 14 inches x 14 inches x 14 inches and volume capacity of about 1.6 cubic feet each. The sufficiency of storage room makes this unit's carrying capacity quite high thus can hold a wide range of items quite efficiently. Another positive aspect you will love about this organizer system by Tespo is the robust and durable built. Regardless of what you plan to keep in it, the construction is reliable enough. It won't cave in even under full weight. The manufacturer utilizes top quality resin and steel to craft the cubes and heavy-duty plastic connectors to secure the grid. Therefore, you will benefit from timeless storage without replacing any parts. Whether its clothing, books, gaming equipment or any other household essentials, it can take whatever comes its way. Similarly, unlike other closet systems which offer a limited display of items kept, this one features separating spaces and enough width to allow you see and find what you want almost in an instant. And considering this system is freestanding, you have the freedom to move it from one spot to another within the house as your needs may necessitate. 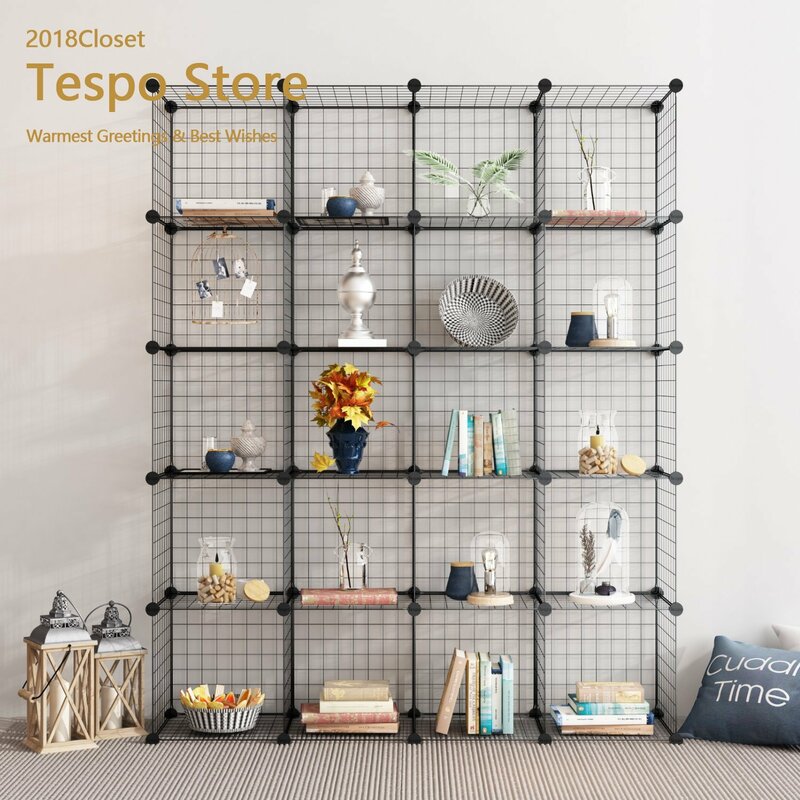 The Tespo Metal Wire is highly recommended if you want to enjoy infinite storage possibilities, considering the interlocking cubes can be arranged to take several shapes depending on your closet or otherwise. It is worth having in mind that this is a budget option hence you can realize an attractive appearance afforded by this system without spending a fortune. Whether you like to economize on space or you just love to see your stuff neat and well organized, there are many reasons to install a closet system. While there are a lot of closet organizer systems out there from which to choose from, only a few models combine all the superb features many consumers are looking for to solve typical organization problems. As far as achieving elevated standards of wardrobe neatness is concerned, the Easy Track Deluxe Starter system is more than capable to help you out. Not only is it a high quality product with great features to meet diverse storage concerns, it is also an affordable option that anyone would be proud to own. This option is a real bargain for individuals seeking a simple and utilitarian kit for complete closet arrangement. To a great extent, this organizer system is quite distinct from most modular versions which are mainly unreliable when it comes to holding a broad variety of items. To the contrary, it comes with sufficient shelves, and garment rods which are impressively solid thus will enable you to get the best out of its layout without any disappointment. When you buy the package you get two 72-inch and 48-inch vertical panels, three 24-inch shelves, one 24-inch and another four 35-inch wardrobe rods, and also two 48-inch Easy Track rails. It only requires a space of any size ranging from 4 ft. to 8 ft. and you can have it up for use. Of course, installation is a cakewalk no matter where you prefer it placed regardless of whether it is a luxury walk-in closet, a reach-in closet or just a plain wall. Besides, the manufacturer includes a handy installation manual to guide through the steps. When complete this closet organizer system can carry a load capacity of up to 1200 pounds. There are adequate complementary accessories such as baskets, drawers that will let you make adjustments on the overall structure or how it serves your interests as the need arises. With this system everything is as easy as the name suggests. Indeed, this 8 ft. wide closet will help you explore your creativity by allowing you to play out with available accessories which you can get separately to create a suiting closet storage space. It's nearly all you need to get to forget about the annoying packs of clutter. The number one factor you should have in mind is the size of the space you want to install the system. Whether it’s a freestanding or a wall-hung kit, you should always take the measurements beforehand from which you can compare what works and what does not. It will be disappointing to order for a model only to find that it cannot fit after delivery. However, if you have more than enough room that can take the largest piece available in the market, you can think about items you may want the store. It is reasonably so because while you want everything to sit pretty at a particular spot, you won’t achieve that beautiful look if you have stuff randomly distributed across the shelves reason being you have too much space. The same way you don’t want to end up with something too small that will all the same appear crowded at full capacity. Your selection should also be guided by the firmness and the kit’s ability to last long. In most cases, most manufacturers use wood, steel, heavy-duty plastics among other substances. The nature of material aside, you should always ensure they are of high quality, reliable, and can withstand a reasonable load capacity in line your needs. That way you will avoid frustrations of a system crumbling down within a short period of use. Similarly, check for elements such as anti-scratch and anti-rust coating. Such properties are a guarantee that the kit will retain the sleek finish for a long time to come. A good closet organizing system is that which is designed to make your life easy. Therefore, you should settle for a unit that will allow you to get most out of the available space while also giving you the freedom to make adjustments as the needs also change. Again, it should give you the leeway to bring on additional storage accessories and be customizable for use under different circumstances. You can also consider visibility of items and how quick and easy it is to reach them when weighing your options. Overall, all the features should be tailored towards making the user experience quite enjoyable. Another critical factor you should put into account when searching for the best closet organizer is the simplicity of configuration. To afford you easy time while setting up the unit, most manufacturers design their models such that they do not require professional skills to install. Likewise, a sound system should not need tools to fix or cut the parts to size. But in case you have to use any, it should be at the very minimal. Also, a real bargain should come with a handy manual with detailed instructions to help you sail through the installation process without straining. Above all, the manufacturer should include all the installation hardware to reduce any troubles of separate buying. Q: What is the best closet organizer system? A: While some brands or models are more popular than others among consumers, there is still no clear-cut winner. The decision on the best model will depend on individual tastes and preferences in addition to how the features are suited to your specific needs. Q: Which models are better? 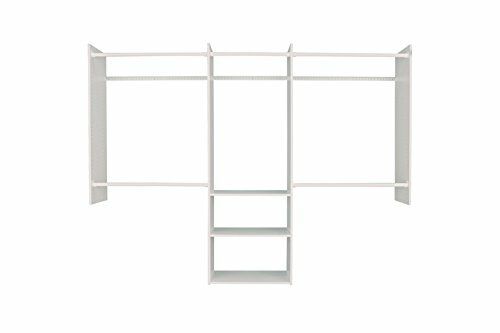 Wall-hung or Freestanding closet organizer systems? A: A closet organizer systems can be designed to be freestanding or wall fixable although most units blend both descriptions. Usually, wall fixable systems are more stable and safe while freestanding versions come with the advantage of being portable and more customizable. Getting a kit that can work either way will most certainly be a better bet although your decision on what is better should rest majorly on a system’s suitability to solve your storage problems. As much as you would love an aesthetically designed closet organizer system, your decision to settle for a particular model should primarily center on achieving a year-round clutter-free closet. In your quest for the best it is always worth noting that all the available options from different brands are crafted to suit particular needs. As such, none is good enough for everyone. Whether you want a starter system or an addition to keep up with the requirements of your family, with our top picks listed above, you can find some of the best quality closet organizer systems that are worth trying.